← Why Buying Green Is Not Always Eco-Friendly. This guest post from Jim is part of the “reader stories” feature at Prairie Eco-Thrifter. Some stories contain general advice while others are tales of how a PET reader achieved success or failure. These stories feature people from all backgrounds and levels of financial maturity and with all sorts of incomes. If you’re like many people, you didn’t see the need to have a financial plan when you were young and just starting out. This was me, that’s for sure. I mean, I was young, life was good, things were happening; what did I need all that finance stuff for? I was doing OK! Then life got in the way – my career took off, I got married, had a couple of kids and settled into a busy lifestyle. I was nearly forty-one before I realized that I had been coasting along, financially, and had no idea where I was headed. As for retirement; well, it was in the distant future. Oh sure, I had a few 401Ks from different jobs I’d had through the years but I had no firm financial plan in place. I had never given any thought to how much I would need to live on in retirement, let alone develop a plan to achieve it! Luckily, I woke up to myself and got some good advice about financial planning. It turns out that over 40s can successfully plan for retirement; it’s just much better if you start earlier. I am proof that it’s never too late too start. It seems that many people find themselves at forty years of age without any sort of financial plan in place. Like me, when they were younger, it didn’t seem a priority and then life became busy with careers, children and juggling activities. 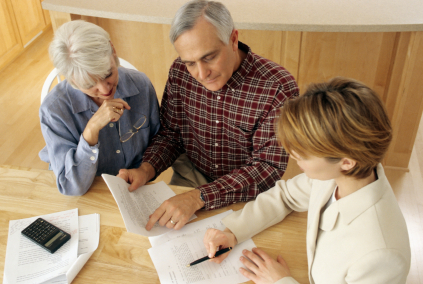 ‘Better late than never’ is a good approach to personal finance for the over 40s. The best thing I could have done was to seek professional advice. There are lots of financial advisors out there who are trained in the art of financial planning, debt reduction and other financial strategies. Find one who is also experienced with helping late starters, like me. The first important thing to do is calculate how much you estimate you are going to need to fund your retirement. To do this, you need the age you intend to retire, the number of years you intend to live and how much money you think you’ll need to maintain your current lifestyle each year. If you think these numbers are impossible to calculate, you’re right; so just work on averages to get started. You can adjust the figures as you go along. Try not to get bogged down with too much detail here and don’t panic when you see the final figure. If you like, you can use one of the many free online retirement calculator programs to help you with this estimate. When you have a retirement figure, divide it by the number of years you intend to keep working and you will have the amount you need to save every year until you give up work. You then have to work out how to be able to save that amount out of each pay check. You may need to look at some areas where you are over-spending; for me it was dining out too often and expensive entertainment. I found I was able to shave $50 dollars a week from these two areas alone; my financial guy said that, over the next 20 years, this would grow to around $80,000 at 4% interest! I’m looking for ways to shave even more off our spending to improve on this figure. One strategy you might have to consider is to keep working after retirement age, so you have built a bigger nest egg before you retire. Even working for just an extra 3 years can make a huge difference to the cash you will have in retirement. Some people take on a second job to help fund their retirement; others do part-time work during retirement to keep some income coming in to augment their savings. Another reason for staying in the workforce longer is to delay getting Social Security. Each year you delay, the benefit goes up about 8% up to age 70. The next important thing to do is to work out the value of savings, investments and retirement plans you already have. These can help to fund your retirement and increase the amount of disposable cash you have during those years. Another tip I learnt – you may be losing money in fees and charges if you have multiple accounts. Get advice about consolidating them into one or two. Look for the best ways to save for retirement. If you don’t participate in your employer’s retirement plan, open one now and start contributing the maximum you are allowed. The tax laws now allow workers over 50 to increase their contributions, so if this is you, find out more. Ask if your employer matches your contributions – this is free money that you need to tap into. A big problem faced by the over 40s, as they work towards a comfortable retirement, is debt. The last thing you need after retirement is debts you are still paying off. It is important to address these now; seek professional advice about consolidation of debts, debt management and early pay out of debts, especially credit cards. Going into retirement debt-free is going to make life so much easier for you. Look at ways you can improve your financial position if you are an empty-nester. As your kids grow up and leave home, you might consider down-sizing your home to reduce or eliminate your mortgage. You might decide you don’t need two family-sized cars anymore. If you invest the savings, your retirement accounts will look so much healthier. The message here is – start now; don’t delay retirement planning any longer! So, is there anyone else out there like me that started saving in their 40’s? I would love to hear your story so please share. Reminder: This is a story from one of your fellow readers. Please be nice. Remember that this guest author isn’t a professional writer, and is just learning about money like you are. Henceforth, unduly nasty comments on readers stories will be removed or edited. PS: If you have story to share, please submit it here. Thanks for sharing, Jim. And yes, I agree that one can start planning for older age at any time and some of the mantra’s of personal finance can be re-visited. Start saving early – it seems to me that if one invests in themselves when they are young they will increase their earning over their life time. Given that, if the start saving a bit in their 30s and accelerate after that, peaking in their 50s they should be OK. More than OK.
One thing that I need to ask though is how do you plan on how long do you live? Or what happens at the end, for that matter (do you need long term care for instance)? I think this is something we all struggle with. No one knows what the future holds. For us, we are working on a combination of savings and insurance policies so that we can have some kind of income protection. No guarantee though. It is never too late to plan for the future, especially in your 40’s. Obviously it is better to start as young as possible but your not the only one in this position. You would probably be surprised at the number of people in their 40’s who are in the same boat. Very true. I know a lot of people who are in that boat. Many of the PF blogs that I’ve read on saving for retirement present some great ideas, and are worth reading. However, I’ve noticed that many of them are by the 20-something crowd specifically for the 20-something crowd. So, it’s refreshing to come across a post that is aimed at those over 40. The idea here is that retirement savings is not strictly for the young, and that if your passed 40, your savings life is not over. For that, I want to give you a big thank you. Glad you enjoyed the article. No things are not over if you are 40+. You just need to change your strategy. I have been there too Jeremy. I did not do as much in my 20’s as I could have. However we both still have time. Don’t focus on the big number. Focus on short term goals that add up. I find it much more motivating. I sometimes had clients come to start in their 50s. Great story and wonderful advice. You can’t do anything about yesterday. Start now. True. That is my life motto. Look forward not backward. I was getting scared reading around in blogland – the “if you haven’t started a pension by the age of12 you are screwed” brigade. Today I have picked up my phone to talk to an advisor to at least find out what my numbers “should” be – its a late step, but at least I am moving. That’s great news. Being proactive to find out your options is a great way to manage life in general if you ask me. Hope everything works out. I started investing in mutual funds this year and my plan is to open a 403(b) by the end of the year. I just turned 40 and know I’m behind, but there’s still time to catch up! These are great tips that make me realize I probably need to speak to a financial consultant. You have started which is what matters. That is the biggest and most beneficial step. I am glad you are making saving a priority. Let me know how things go with the planning. Great article! It’s refreshing to read a post from someone who has gone through this. I know some people who lost a ton of money in the market crash and who are basically starting over in their 40s and 50s — they are now talking with financial planners about their options. Good point. A lot of people have been put in this situation even though they tried to avoid it. The recession hurt a lot of people. It is good to see people trying to get back at it again and saving.